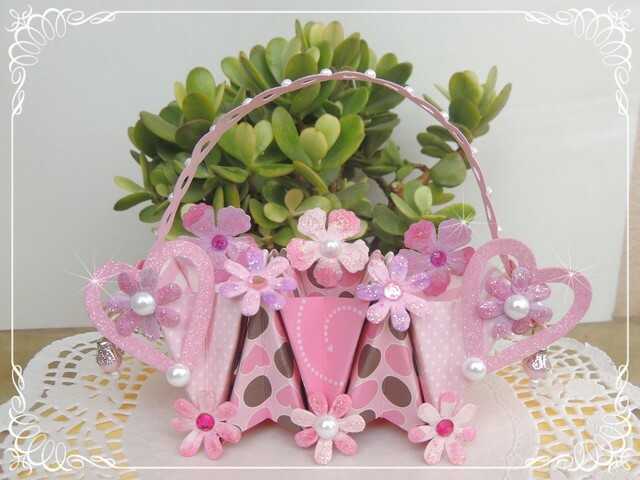 This easy to make paper basket is my Guest DT project for Itsy Bitsy. 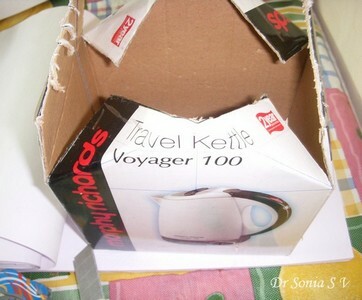 At the outset itself let me confess I am not good at origami..I cannot even make the common origami paper aeroplanes ! 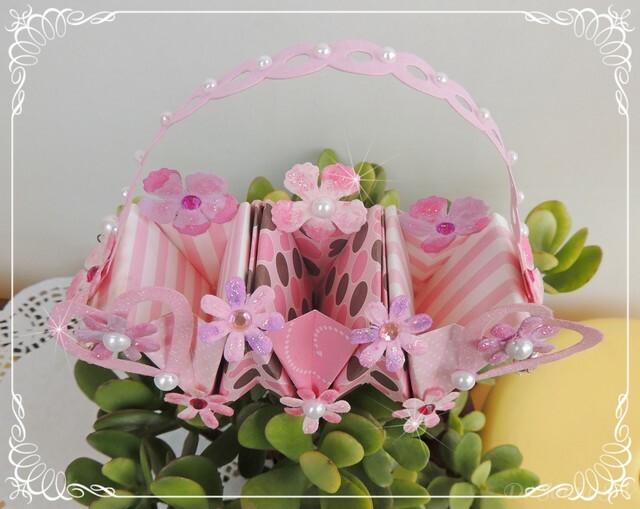 But I was so fascinated when I saw this accordion style Paper Basket on Pinterest that I overcame 2 pet peeves [which are 1.I dont have the patience for You tube videos and 2. 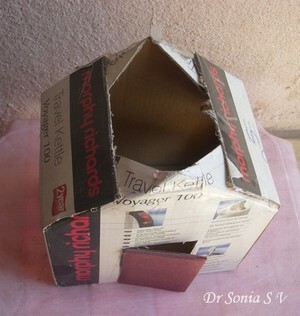 I am not skilled at origami]to make this paper folded basket. 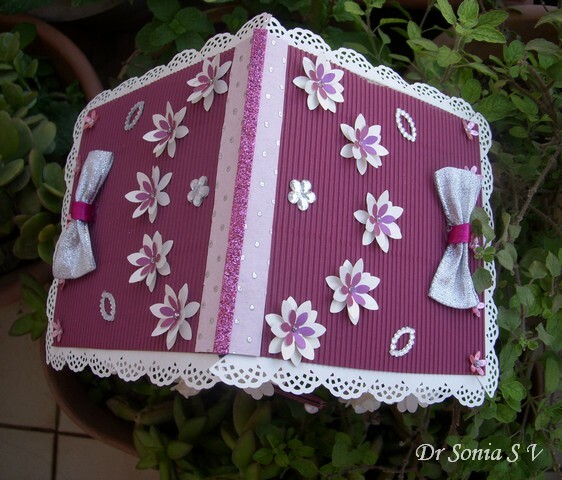 I used 5 squares of 6 x 6 inch double sided pattern paper to make this 3 compartment paper basket. 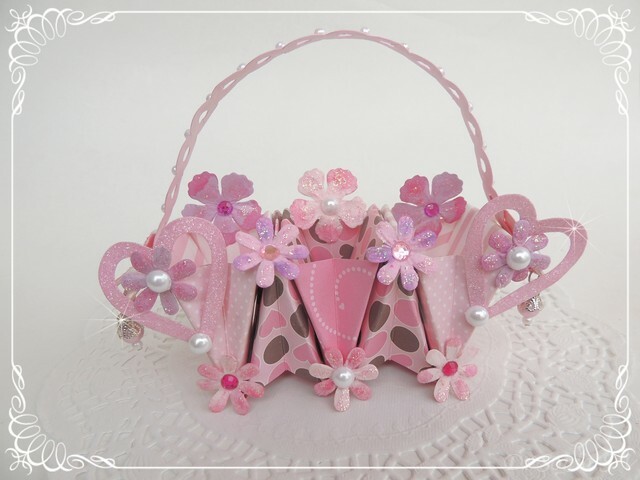 Without the handle ,the charm of this paper basket is that it folds flat in an accordion style! 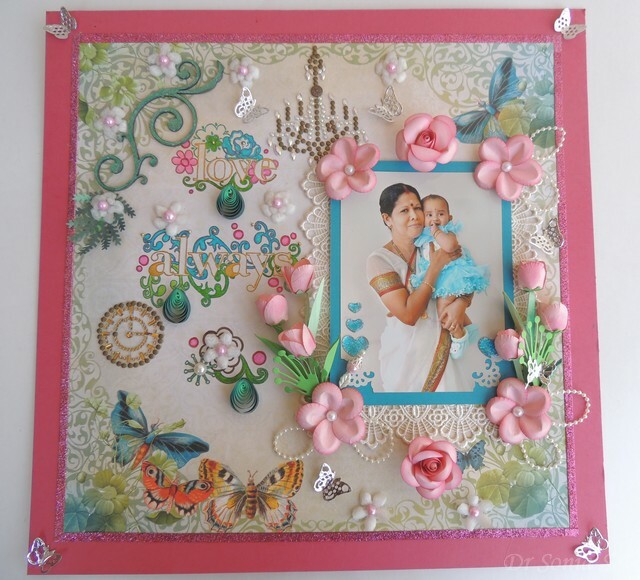 This spring theme layout is my Guest DT project for Hands to Hearts on the theme Celebrating Womanhood . 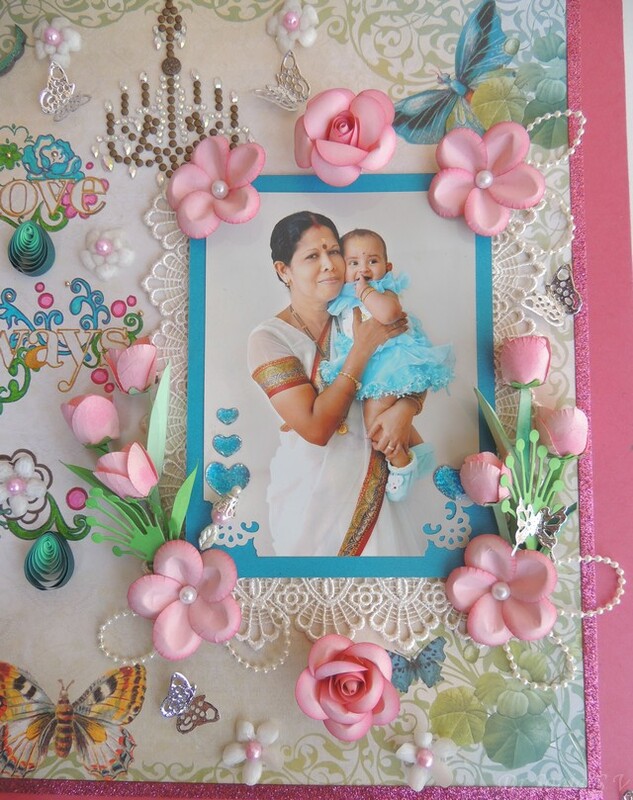 This layout features my mothers younger sister with my daughter in a spring theme layout with lots of punchcraft flowers. 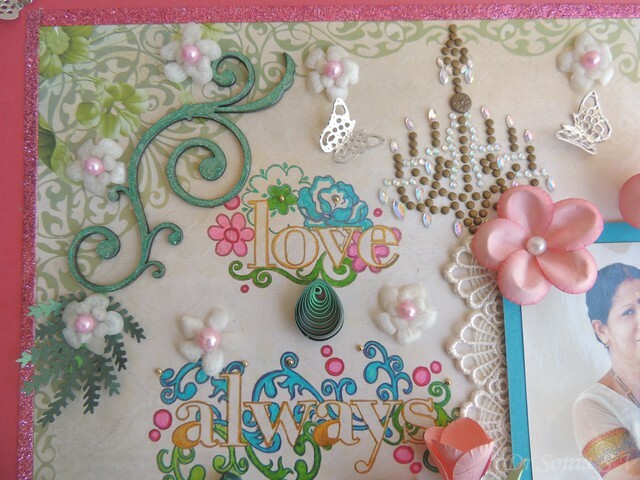 I layered the photo on lace and added gel heart stickers, a handmade stick pin ,pearl strings ,Marianne die cut leaves and lots of handmade punchcraft flowers. 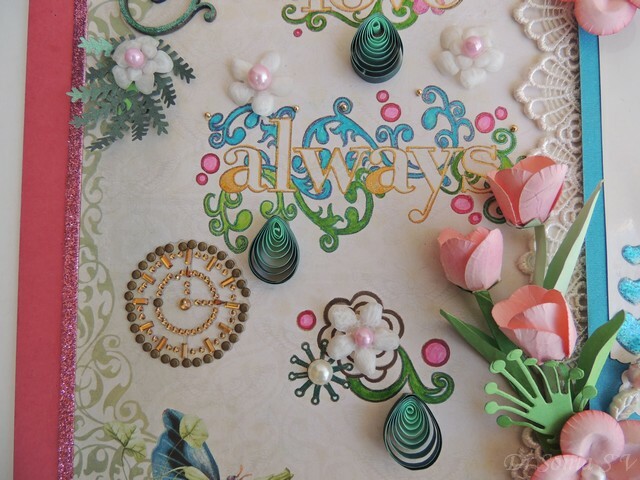 The vintage chandelier and clock are rhinestone stickers.The chipboard flourish is painted with a gel pen and coated with glossy accent .I used parchment paper to make the white punchcraft flowers. 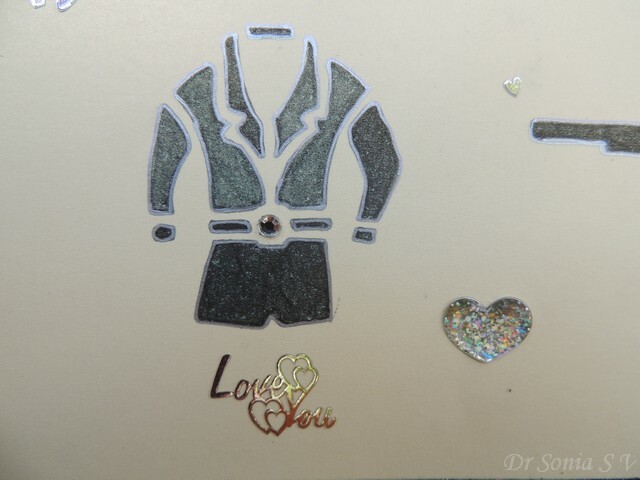 Since I was not confident about my stamping, to jazz it up a bit ,I added tiny bindis[we Indian ladies use it to adorn our foreheads as a fashion accessory!] 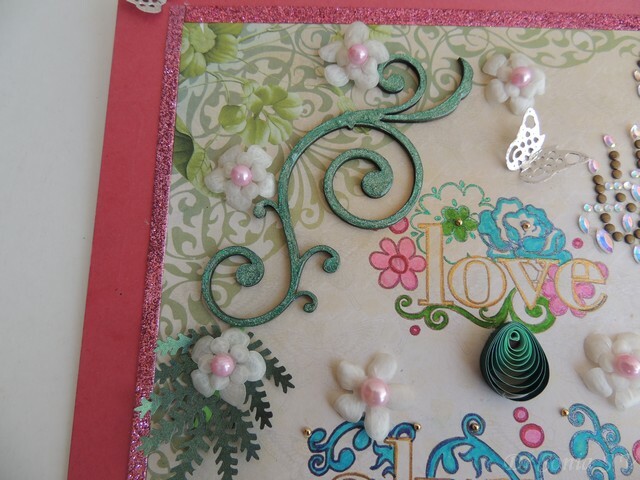 and tear drop quilling. 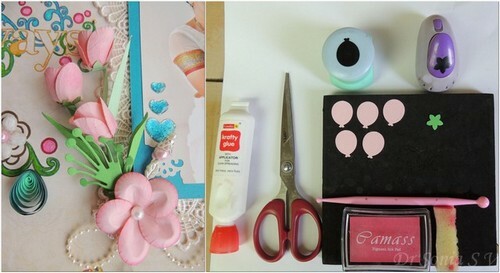 Sharing a simple and quick paper flower tutorial. 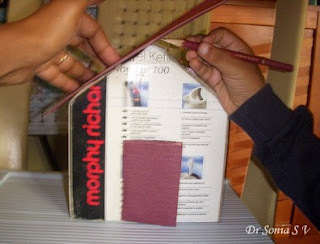 Paper : Cardstock or thinner paper depending on what your punch can punch! 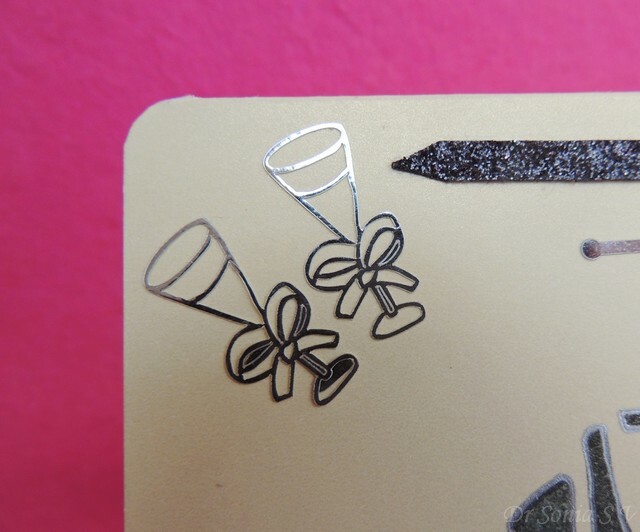 Punches : Medium Jef balloon, Small Jef 5 petal. 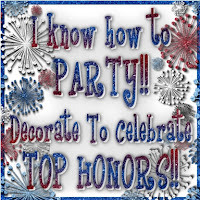 If you dont have punches hand cut an ovoid shape. 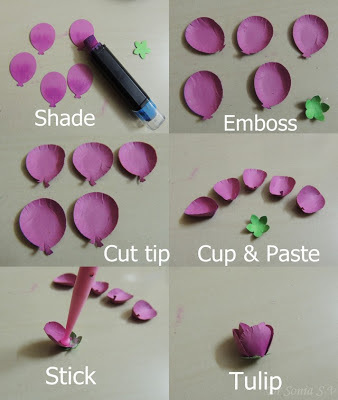 I folded a strip of card stock and attached it to the base of the tulip.If you are on pinterest , pinning this collage summarizes the steps in this tulip flower punchcraft tutorial. 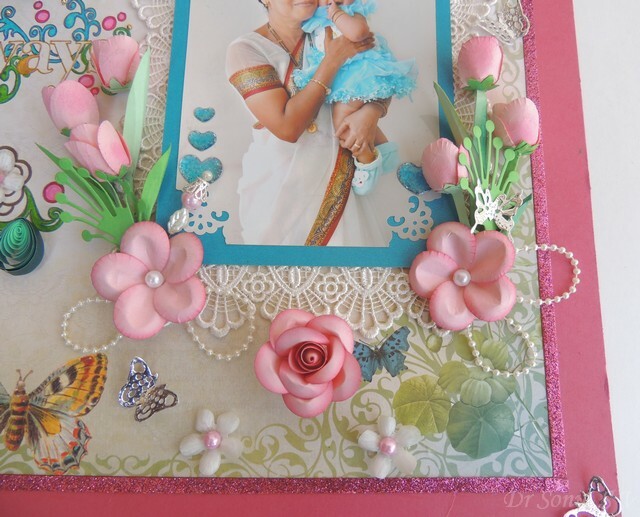 All the paper flowers in this project were made using the balloon punch. Dear friends I had earlier posted about a DIY sheep costume we made for my daughter's show and tell .Well recently the Hindi Show and Tell theme was modes of transport . 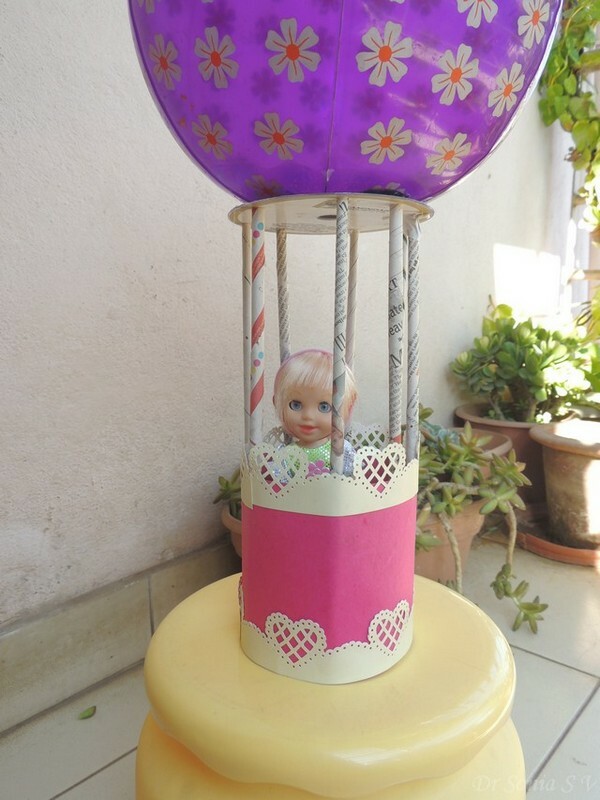 While most kids took toy cars or at the most paper aeroplanes my high achiever little one insisted she wanted to take a home made hot air balloon. 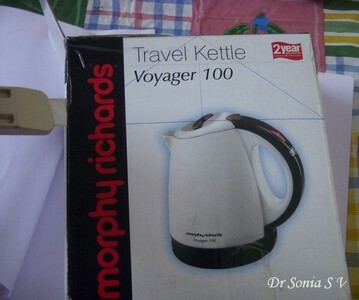 That day my work was too hectic and I couldnt really devote time to design let alone think about her hot air balloon! 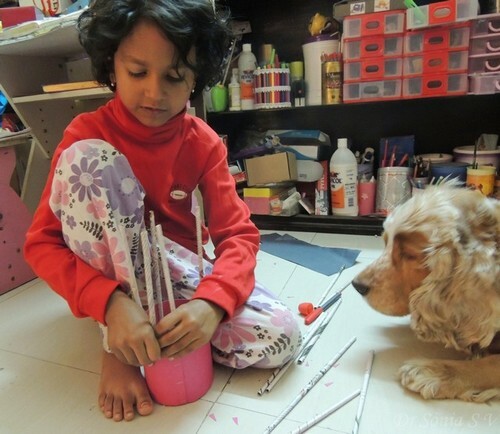 It broke my heart when in the evening she tried to make a balloon all on her own! 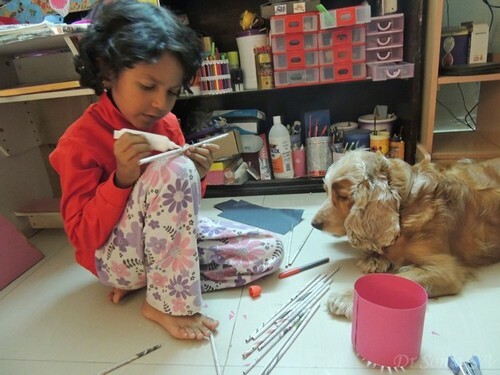 [Kids do have ways to make us moms feel guilty dont they!]. 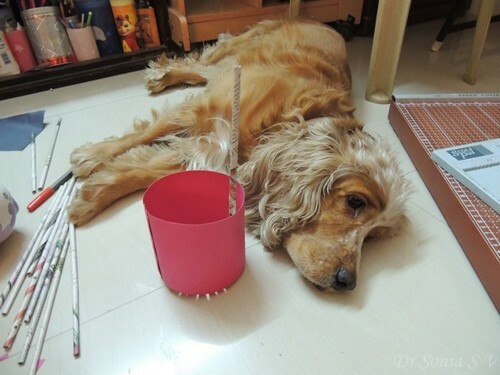 We had some newspaper rolls left over from our woodland recycled craft and she stuck the rolls inside the paper cylinder while our Goldy tried to sleep among all the mess created by our hot air ballon craft! 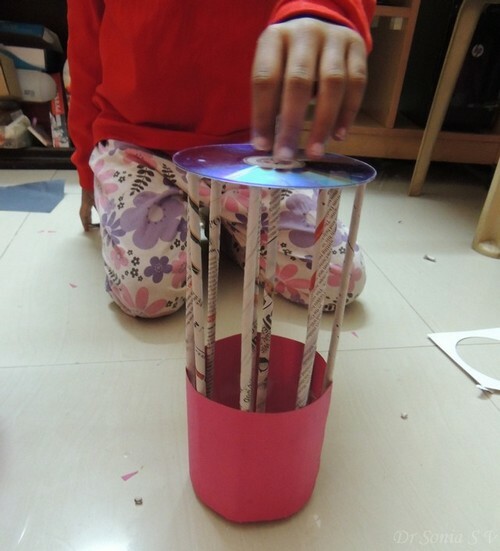 I cut out a circle for the base of the basket and my little one glued the zig zag teeth to the circle to complete the base of our paper hot air balloon. 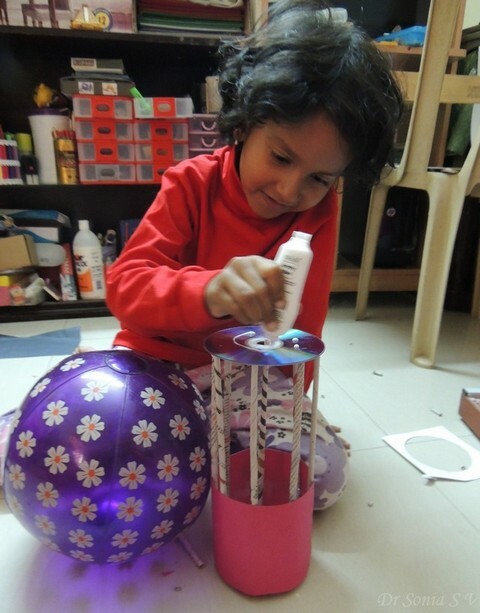 We stuck a disc of paper on the shiny surface of the CD and my daughter applied a crazy amount of glue on the top of the CD before sticking the ball.Surprisingly our plastic ball stuck well and survived the journey to school and back! 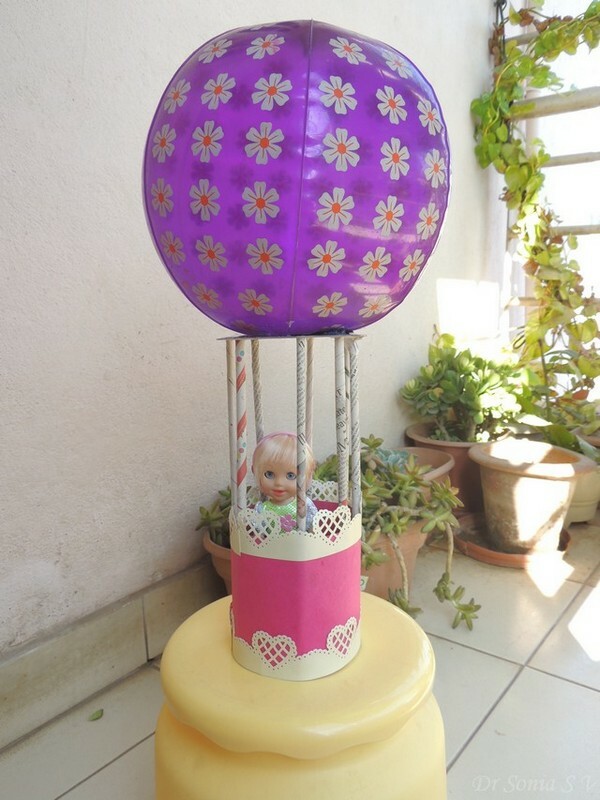 My daughters school is big on recycling and when we finished she proudly exclaimed to me that since we had recycled a CD and newspapers,our hot air balloon was a recycled craft! We didnt have much time for decorating and so this project went rather raw to her school!Surprisingly my daughter came home that day beaming that not only her Hindhi teacher but also the Principal of the school had praised her hot air balloon! 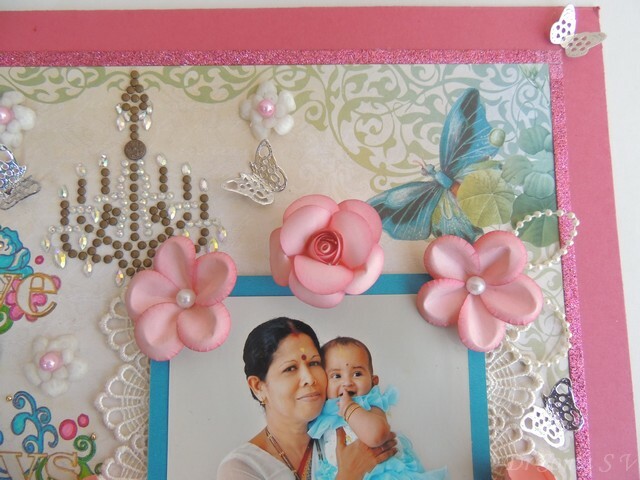 So any similarly harassed moms out there take heart sometimes crazily put together simple projects turn out great !! 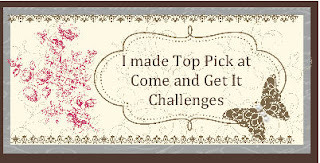 Edited : This project was the top pick of 2 of the Designers at Come and Get it recycle theme challenge..so thrilled!! Once a blogger friend asked me if I ever made "simple" cards!! 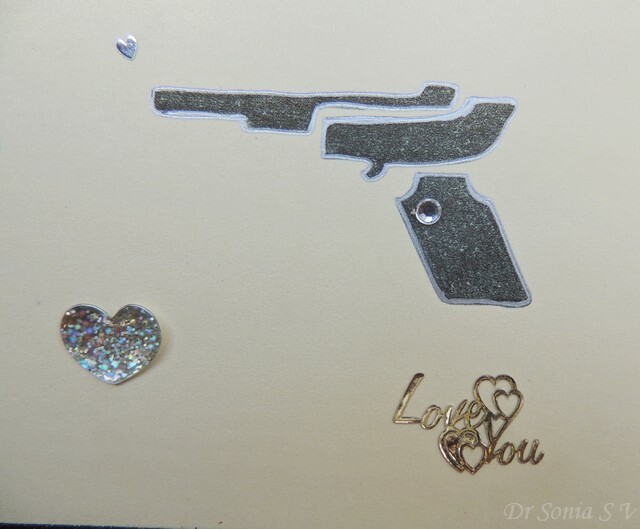 Well this one is as simple as it comes!This James Bond theme card is a birthday card for my hubby who is a big 007 fan. 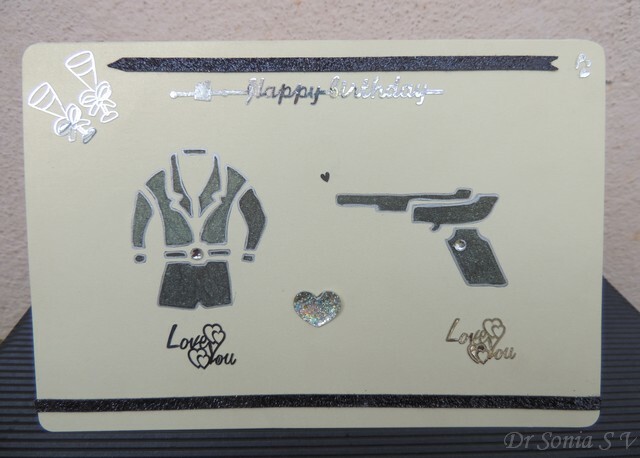 The idea was my daughters and we used her alphabet stencils to make the coat and gun.I used rhinestones on the belt of the coat and on the gun to glamorize the CAS card! 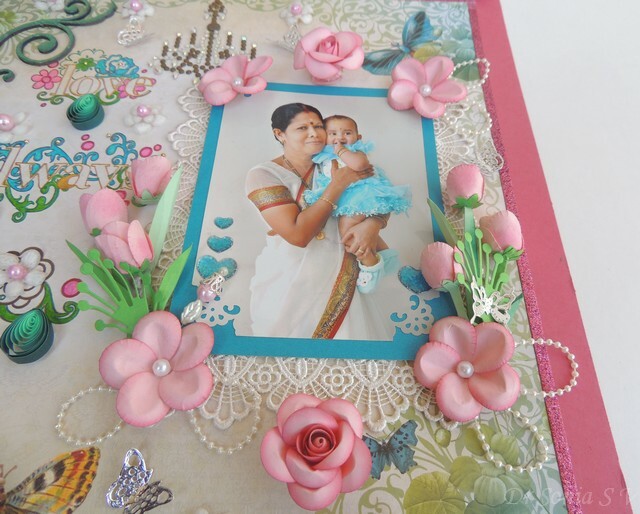 Slider Pop Up card- this one is a tutorial. 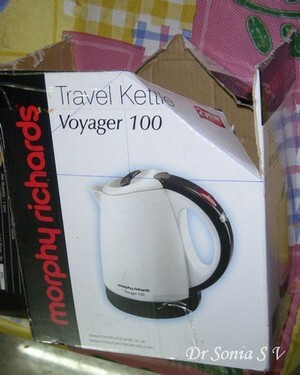 And some have been way too wacky to blog about!! 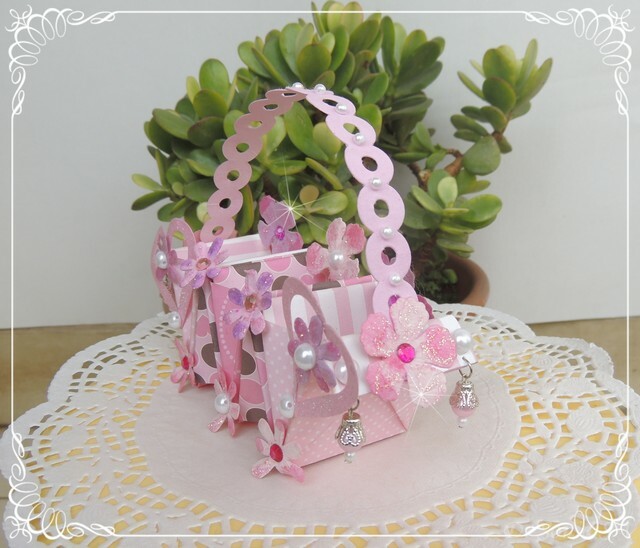 Dear friends sharing a recycling craft tutorial I had Guest posted some time back at my friend Yvonne's blog ! 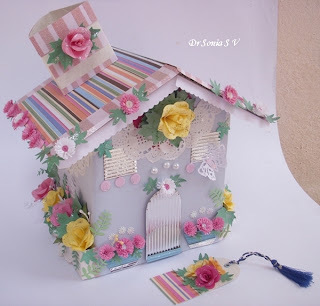 I made this doll house with my then 5 year old daughter who loves to craft with me.We decorated our doll house with quilling and handmade punchcraft flowers . 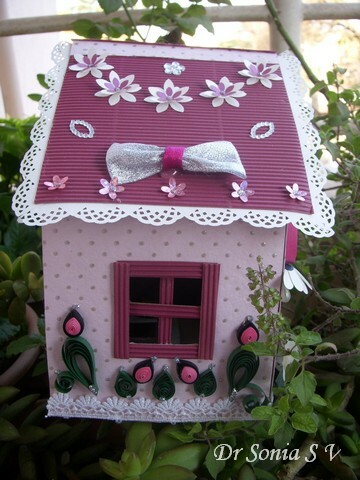 Stick the side wall flaps to the triangular flaps from the front and back of the house and the basic frame work of your doll house is ready. My little one wanted the door to swing open and fortunately the cardboard was strong enough to withstand our architectural efforts! 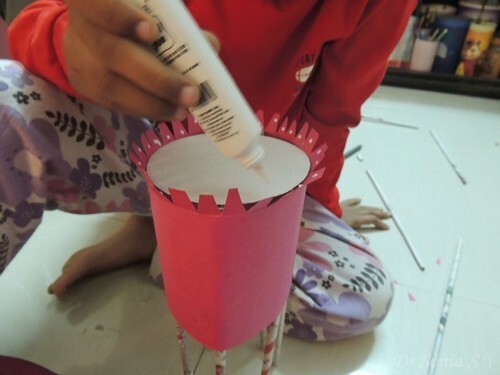 If you want to make a detachable roof so that you have a house shaped box here is the tutorial link : House shaped box.Here is my young architect decorating her cardboard doll house and enjoying our recycling craft. Our roof has 2 pieces of corrugated card glued down in the middle with pattern paper. 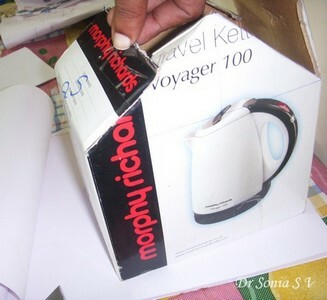 I used a Fiskars punch [ Thank You Priya!] 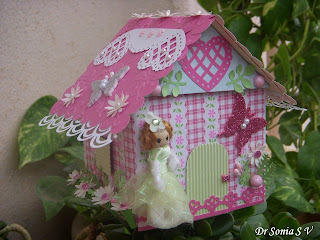 to make the lacy roof of the doll house.We also added some homemade fabric bows and punchcraft flowers. 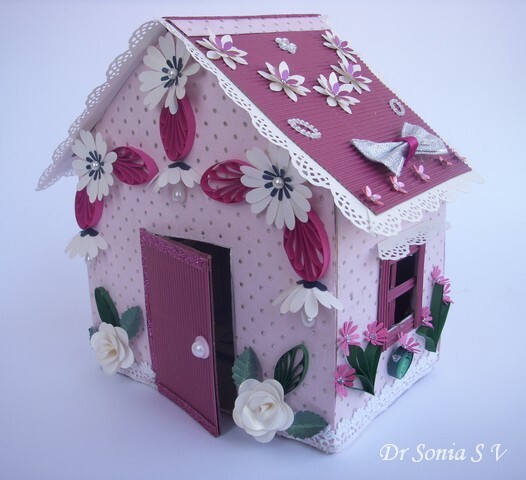 My daughter wanted a window so hand cut a window and hid the jagged edges using corrugated paper and jazzed up the wall with some quilling. 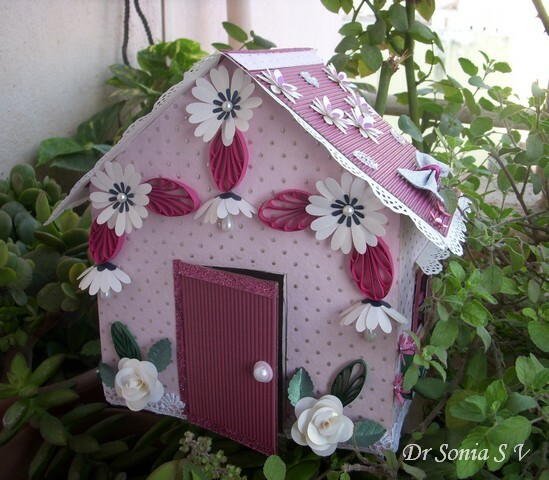 Here is our cardboard doll house in our garden ready to play with. 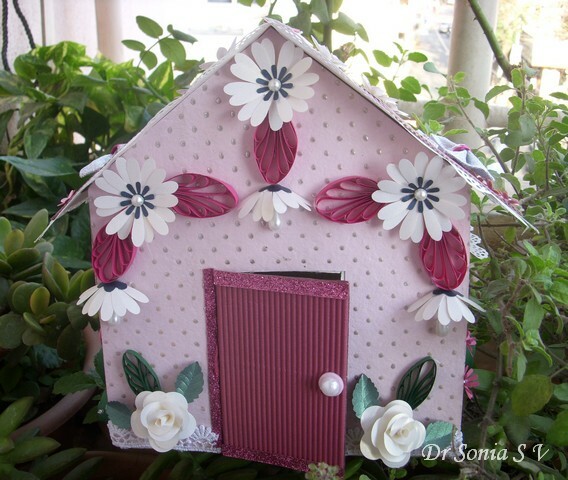 If you keep the decoration minimal,making these cardboard doll houses is quite a quick craft for a school project, an xmas tree decoration or just to pretty up your house with a fabulous recycling craft. 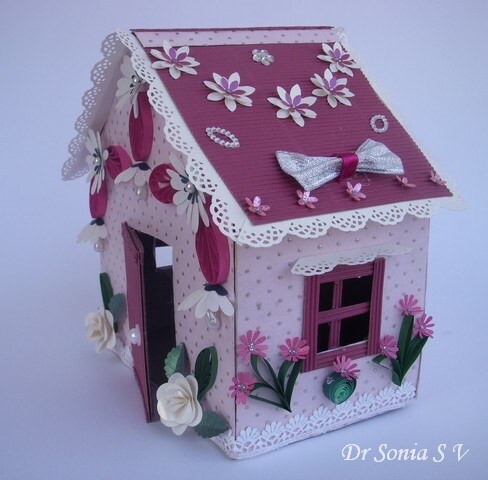 I know most of my old followers have seen this Doll House as its one of my most popular ones [it had won top 3 at 4 different challenges] but I have never shared the tutorial on my blog before so just reviving a favorite recycling project with an extra zing!